The Virgin London Marathon is probably the most iconic race in the British racing calendar. Its route weaves around some of the capital city’s most famous sights as runners start in Greenwich, wend their way through Deptford, cross over to the Docklands before heading back over Victoria Embankment to end in Westminster. The runners merge around the 3-mile mark (although the celebrities join the championship runners just before the first mile), and this route preview focuses on the mass start course. The first thing most runners want to know about a route is whether there are any hills for which they need to reserve their energy. The good news for London Marathon runners is that the course is pretty flat, starting with a gentle downhill section and only climbing a few feet in a couple of places. Are there any hills on the Virgin London Marathon route? Nope! If you’re worried about the slightest incline, save yourself some energy for miles 19 and 23. Most importantly, though, try not to power through the downhill section between miles 2 and 4 – tempting as it might be, you need to keep some strength left for the remaining 22.2 miles. 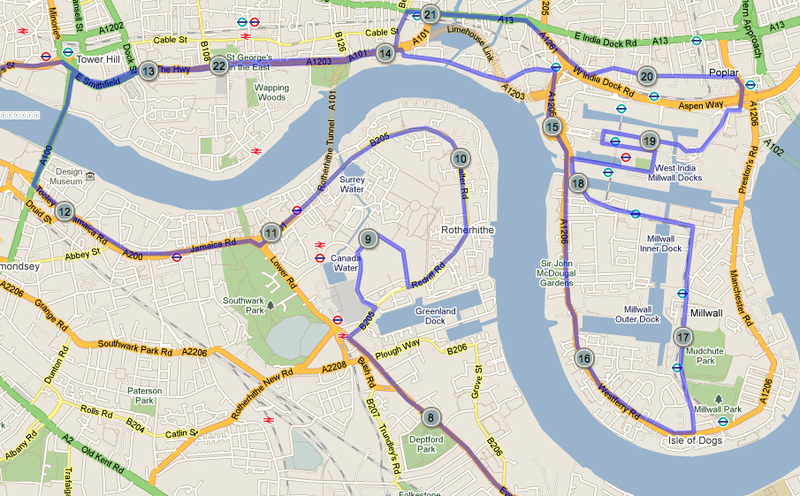 Starting in Greenwich Park, runners head east to Woolwich before cutting towards the Thames and then back towards Deptford. The mass start can take a long time to clear (perhaps unsurprising as you’re pushing somewhere in the region of 25,000 runners – there is a total of 36,500 runners registered for the race each year – through a comparatively narrow gate), so there will be a gap of at least a couple of minutes between the starter’s gun and you toeing the start line. Because the marathon is so large, the organisers record each runner’s time based on when they cross the start line rather than from the time the gun goes off. So, if you’re stuck behind a charity rhino but gagging to make a good time, don’t fret. Again, if you’re looking for a fast time, stick to the edges of the course rather than the race line for the early miles as it can get very congested. Darting round other runners at the periphery of the route may add distance to your race, but it may be the only option to keep the pace you want. The first few miles are relatively light on sights once you’ve left Greenwich Park (and the meridian line, of course) behind. However, on turning back east, you pass the National Maritime Museum and close to the Cutty Sark between miles 6 and 7. The organisers expect Greenwich to be ram-packed with spectators and long delays on tubes, so if you’re planning to watch the race, best avoid the early miles. Entering Deptford – where 17th-century playwright Christopher Marlowe was killed in a pub – you are now in the main body of the race. Crossing Tower Bridge between miles 12 and 13 is perhaps one of the most well-known sections of the marathon. Remember to wave at the BBC cameras. Heading right from the bridge, you skirt the city’s square mile (the financial district that houses the Bank of England) and head towards the Docklands (the city’s new financial district). If you’re still in the main body of the marathon runners, the Docklands section is likely to be a squeeze after mile 18 – tight corners will prevent you from taking a racing line and, at its peak, may result in congestion. So, if you’re planning a strong time, make sure you’re in a good position by this point. Once through the Docklands, you head back on yourself, keeping to the other side of the road and passing runners going the other way as they head towards the Docklands. Wave and cheer them on. Don’t shout ‘Eat my dust’, although if you’re a bad person, you might just think that. Fancy some proper London sights, guv’nor? Cor blimey Mary Poppins, let’s hope it’s not a pea-souper then. The road passes through a tunnel (during which point you will have to imagine St Paul’s Cathedral and the Millennium Bridge) before spitting you out on Victoria Embankment. The London Eye will be rotating (slowly) and you should soon be able to see Big Ben and the Houses of Parliament. Turning right at Westminster, you score through Britain’s political heart and run alongside St James’s Park. If you’re eagle-eyed, look to your right and see if you can spot the small colony of pelicans that are native to the park. Finally, just as you approach mile 26, Buckingham Palace hoves into sight. Royal wave to the corgis and hang a right at the Spur Road to belt everything you’ve got left to the finish line on The Mall. Worried about getting dehydrated, or short of energy? No need – there are water stations every mile of the course and Lucozade stations at miles 4.5, 9.5, 14.5, 18.5 and 24. However, a word of warning: don’t drink too much! Each year more runners at the London Marathon receive medical attention for over-hydration than dehydration. And, should you be worried about the course closing, the race organisers will start packing up after 6 or 7 hours. If you’re still going, though, they will ask you to move to the pavement and complete the race in your own time. If you are expecting to be significantly slower than this, you need to make sure you have your own provisions (water and food) to complete the marathon safely. Want some Virgin London Marathon statistics to whet your appetite for the big day? Then click here. London Marathon 2012 | 10 Highlights! « On life…and then some!